1095 lbs or 8 persons. Weighting Concern???? I have a 2002 Malibu Sportster LX. The capacity of the boat is 1095 lbs or 8 persons. I've got the wedge but would like to add more weight. How much weight can I safely add? Any problems from the DNR if I get pulled over with more weight then the manufacturer recommends? There has been conflicting answers to that. Some people say that water ballast (neutral) does not counta against the weight rating. Peronsally, I think it does. I have heard of people getting in trouble for over-loading their boats with water ballast. I'm not making any suggestion about how much weight you can safely add. The CG sets their limits for a reason. I agree, weight is weight & if you overload your boat you run the risk of swamping it. The Sportster does not have a lot of freeboard so I wouldn't recommend going much over that limit. Peronsally? what the heck am I typing?!! Heavy boarders will bring on as much weight as their boat can handle, this generally brings the water up to the rubrail. Is that safe? Not in my opinion. But that's what their doing. The Man can and will give you a ticket if you're over the weight limit IN THEIR OPINION. So, don't make them mad. I had at least 12 people in my boat (1/2 were kids), had balasts full and had one of my rear lockers over stuffed with two 440LB fat sacs. The Man didn't say anything about the weight, he did complain about me surfing so close to the boat without a rope though. One of the rangers actually recommended I add MORE weight to get a bigger wake. Go figure. No coffee yet this morning maybe? Don't go over the weight limit. People numbers are just estimates by average weight. Just place your weight (people) stragegically when you need a big wake! If you overweight the boat it will tip very easily in a turn. Our ski club did it, and we learned the lesson. MalibuDoc, Did the sportster sink? How much weight was in it at the time? Thanks, this is exactly the info I'm looking for. I wouldnt' worry about the weight too much. Check out this boat! I can't remember which model this is...Response maybe. That picture above is a sportster. I had a 98 Sportster LX, we had the wedge, 500 pounds of lead, 150 pounds of sand and then often had a boat full of people. 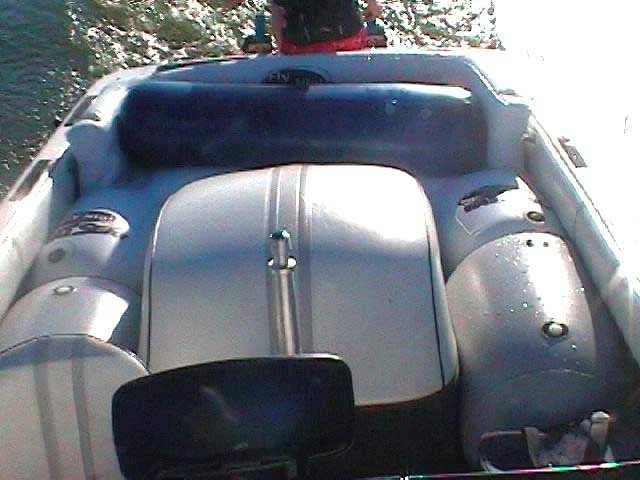 I used the boat mostly on a smaller lake and didn't have to worry much about big boat wakes or anything that might threaten the saftey of the boat other than my own driving. I never had any issues with the boat, never came close to sinking it, and the wake was pretty impressive. The gunnels of the sportster are not very high so the potential is there to easily take water over the sides if it's weighted down. While I never had any water come over the sides I'm not saying it couldn't/wouldn't happen pretty easily. If your concerned with the boat itself, add small amounts at a time and see how it does. If your worried about the MAN, then add lead or sand and hide it in the boat - but remember lead and sand will push the boat to the bottom of the lake if it fills up with water while fatsacks are neutrally boyant and will not push a boat to the bottom of the lake, but not like it matters, I don't think a sportster would float anyways if it was swamped. Got a big metal anchor sitting right in the middle! that is quite a bit of weight!!! i thought i was crazy at 1100-1200 plus people, gear, and gas. after i buy a prop, i'm getting the pro-z v-drive sacks. so it'll be 2000# in sacks and wedge. woohoo!! The water was at the rub rail in the back, we had an entire barefoot line in the boat (I think 9 or 10 plus the driver) and in a slowish turn she turned over and sank with just the nose sticking out of the water. We had our twin ( 2x 200 Murc's) hydrodyne in the water already. We slammed the Final pyramid support rope (4 inch tow strap) to the front grommet and unleashed the 400 horses to lauch the poor ship back to the surface. While the twin was nose out of the water (popping a wheely), it was able to plane out the sinker! Enough water sloshed out to keep her a'float and we put her on the shore. We bailed her out and drained the engine and used it in the show the next night!!! didn't have to worry much about. . .anything that might threaten the saftey of the boat other than my own driving. Now THAT is a leap of faith. (j/k) But perhaps we shouldn't talk about the need for faith at this particular juncture. Edited to add the smiley. If I remember correct, my Malibu owners manual says that ballast counts twords the total capacity. What does the extra weight do to the engine? Does it put a lot of strees to surf at 11 mph and turn 2600 rpms?